This building is in the parish of St Michael-at-the-Northgate Church. 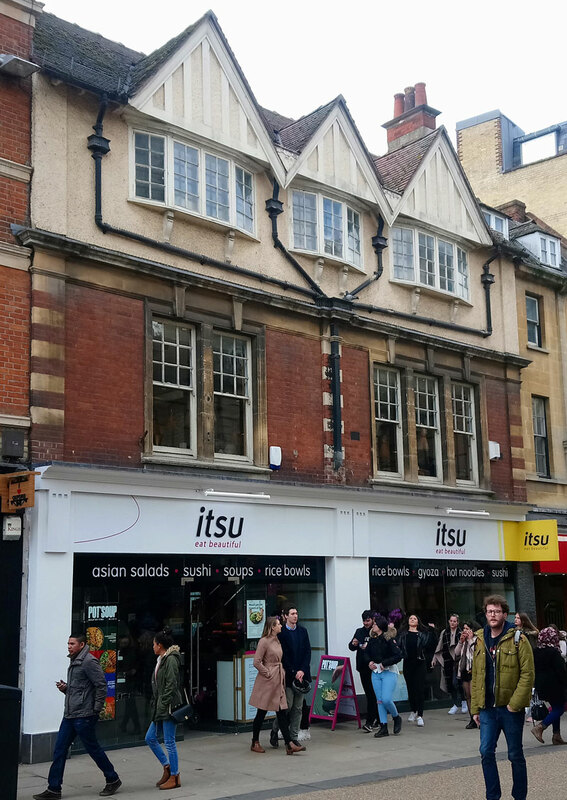 For leases on the former property on this site granted by Oxford City Council from 1606 to1674, see Salter, Oxford City Properties, pp. 241–243. After that date it was united with the Bocardo prison and became the residence of the gaoler. Marquis of Granby by 1842. In about 1905 No. 36 was rebuilt as two properties, with a pub (the North Gate Tavern) on the left at No. 36, and a shop on the right at No. 36A.. The Northgate Tavern closed on 22 November 1971. By 1998 the two shops had been converted into one. Occupants of 36 Cornmarket Street listed in directories etc. John Brightwell (30), victualler, lived here at this (unnamed) pub with Jane (25) and Charles (twelve months) and Eliza and Bryan Brightwell (both 15). There are three male servants and another boy of 15 in the household. Frederic Lipscomb (39), a widowed publican, lived here at this (unnamed) pub with his schoolboy son Frederic (10) and an ostler. Thomas Goodger (55), publican, lived here at the Granby’s Head with his wife Sarah (57) and their granddaughter Sarah Jane (10): all three were born in Leicestershire. A sawyer was lodging with them. Richard Coles (35), a jointer, lived here at the Marquis of Granby with his wife Harriet (35) and their children Ernest (11), Edgar (9), Arthur (7), Albert (2), and Harry (six months). There was also a second household here comprising Richard Symm (39), a musician, his wife Martha (39), and their children Richard (13), Clara (11), Alice (9), Albert (7), Christopher (5), Henrietta (3), and E. Maud (2). Charles Lovelock (49), inn keeper, lived here at the Leopold Arms with his wife Emma (47) and daughters Mary (22) and Juley (eleven months). They had one servant (a cook). Charles Spier (35), licensed victualler, lived here at the Leopold Arms with his wife Mary Ann (35) and their daughter Edith (6). Thomas W. Morgan (36), taverner & blacksmith, lived here at the Leopold Arms with his wife Sarah (36) and his children Albert (8) and Lilian (5). They had a 17-year-old servant girl.